Ritual Blood(1) Pthumeru Chalice, Pthumeru Root Chalice - / 99 - / 600 Material used in a Holy Chalice ritual. Ritual Blood(2) Central Pthumeru Chalice, Central Pthumeru Root Chalice, Hintertomb Chalice, Hintertomb Root Chalice - / 99 - / 600 Material used in a Holy Chalice ritual. 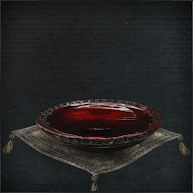 Ritual Blood(3) Lower Pthumeru Chalice, Lower Pthumeru Root Chalice, Lower Hintertomb Chalice, Lower Hintertomb Root Chalice, Sinister Hintertomb Root Chalice - / 99 - / 600 Material used in a Holy Chalice ritual. 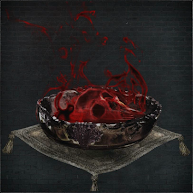 Ritual Blood(4) Defiled Chalice, Cursed and Defiled Root Chalice, Ailing Loran Chalice, Ailing Loran Root Chalice - / 99 - / 600 Material used in a Holy Chalice ritual. 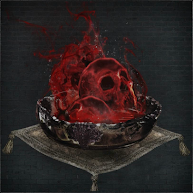 Ritual Blood(5) Great Pthumeru Ihyll Chalice, Pthumeru Ihyll Root Chalice, Sinister Pthumeru Ihyll Root Chalice, Lower Ailing Loran Chalice , Lower Ailing Loran Root Chalice, Sinister Lower Loran Root Chalice, Great Isz Chalice, Isz Root Chalice, Sinister Isz Root Chalice - / 99 - / 600 Material used in a Holy Chalice ritual. Material used in a Holy Chalice rite. When all is melted in blood, all is reborn. You need ritual materials to create a dungeon. Basic and Rite crafting materials can be found mainly in the Chalice Labyrinths from loot chests or enemy drops, with the rarer ones required to craft specific labyrinths also found in the main quest. 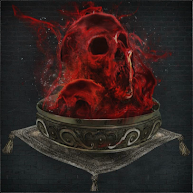 Progressing though the game, acquiring Hunter Badges, defeating bosses and clearing labyrinths will also unlock certain Basic Materials in both Bath Messenger Blood Echoes and Insight shops in the Hunter's Dream. Ritual Blood and Tomb Mold basic materials have a numerical value in brackets next to them. These correspond to the depth/difficulty of a labyrinth, and can also be found on the same depth or one depth below. The highest level of both of these items (5), can be purchased from the Bath Messengers since Patch v1.07 (available on NG+). (4) Farming in Lower Pthumeru Labyrinth L3: The side room before the layer boss (Rom) contains a Kidnapper. 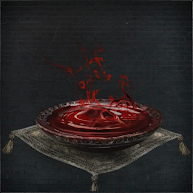 Will drop Ritual Blood(4), Hunter's Mark out and repeat. (5) Farming in Ailing Loran Labyrinth L1: From the second lamp go right in the big room, behind the ladder there is a tunnel that leads to a room with a Scourge Beast and a small chest with Ritual Blood(5) x2. Hunter's Mark out and search for another online dungeon.